This is (to my knowledge) the first time the US Intelligence Community has made a public claim that China has fielded a MIRVed missile system. If so, China joins the club of four other nuclear-armed states that have deployed MIRV for decades: Britain, France, Russia and the United States. For China to join the MIRV club strains China’s claim of having a minimum nuclear deterrent. It is another worrisome sign that China – like the other nuclear-armed states – are trapped in a dynamic technological nuclear arms competition. There have been rumors for many years that China was working on MIRV technology. Some private analysts have even claimed – incorrectly – that China had developed MIRV for the DF-31 ICBM and JL-2 SLBM. A DF-5 ICBM is launched from a silo. 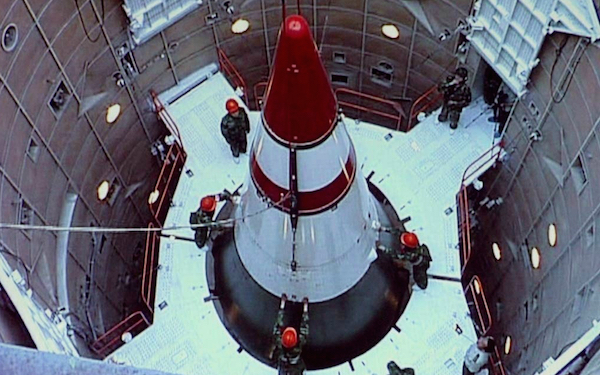 The Pentagon says China has equipped some of its DF-5s with MIRV. Sen. Cochran. How many missiles will China be able to place multiple reentry vehicles on? Mr. Walpole. In the near term, it would be about 20 CSS-4s that they have, the big, large ICBMs. The mobile ICBMs are smaller and it would require a very small warhead for them to put multiple RVs on them. Sen. Cochran. … [D]o you think that China will attempt to develop a multiple warhead capability for its new missiles? Mr. Walpole. Over time they may look at that. That would probably require nuclear testing to get something that small, but I do not think it is something that you would see them focused on for the near term. What makes the Pentagon’s report on the MIRVed DF-5A payload noteworthy is that it was not included in several other intelligence assessments published in the past few months: the prepared threat assessment by the Director of National Intelligence; the prepared threat assessment by the Defense Intelligence Agency; and STRATCOM’s prepared testimony. Nor were a MIRVed DF-5A mentioned in the Pentagon’s report from 2014 or the Air Force National Air and Space Intelligence Center (NASIC) report from July 2013. “Possibly capable of” and “capable of” are not equal assessments; the first includes uncertainty, the second does not. Assuming CIA’s prediction from 15 years ago is correct, the DF-5 MIRV payload might consist of three warheads developed for the DF-31/31A. Whatever the certainty, the MIRVed version of the DF-5 – which I guess we could call DF-5B – is not thought to be loaded with warheads under normal circumstances. In a crisis, the warheads would first have to be brought out of storage and mated with the missile. Moreover, The Pentagon lists two versions of the DF-5 deployed: the DF-5A (CSS-4 Mod 2) and the new DF-5 MIRV (CSS-4 Mod 3). So only a portion of the 20 missiles in as many silos apparently have been equipped for MIRV. The big question is why the Chinese leadership has decided to deploy MIRV on the silo-based, liquid-fuel DF-5A. Chinese MIRV on the DF-5 ICBM is a bad day for nuclear constraint. Seen in the context of China’s other ongoing nuclear modernization programs – deployment of several types of mobile ICBMs and a new class of sea-launched ballistic missile submarines – the deployment of a MIRVed version of the DF-5 ICBM reported by the Pentagon’s annual report strains the credibility of China’s official assurance that it only wants a minimum nuclear deterrent and is not part of a nuclear arms race. MIRV on Chinese ICBMs changes the calculus that other nuclear-armed states will make about China’s nuclear intensions and capacity. Essentially, MIRV allows a much more rapid increase of a nuclear arsenal than single-warhead missile. If China also develops MIRV for a mobile ICBM, then it would further deepen that problem. To its credit, the Chinese nuclear arsenal is still much smaller than that of Russia and the United States. So this is not about a massive Chinese nuclear buildup. Yet the development underscores that a technological nuclear competition among the nuclear-armed states is in full swing – one that China also contributes to. Although it is still unclear what has officially motivated China to deploy a MIRVed version of the DF-5 ICBM now, previous Chinese statements and US intelligence assessments indicate that it may be a reaction to the US development and deployment of missile defense systems that can threaten China’s ability to retaliate with nuclear weapons. If so, how ironic that the US missile defense system – intended to reduce the threat to the United States – instead would seem to have increased the threat by triggering development of MIRV on Chinese ballistic missiles that could destroy more US cities in a potential war. The deployment of a MIRVed DF-5 also raises serious questions about China’s strategic relationship with India. The Pentagon report states that in addition to US missile defense capabilities, “India’s nuclear force is an additional driver behind China’s nuclear force modernization.” There is little doubt that Chinese MIRV has the potential to nudge India into the MIRV club as well. If Chinese MIRV triggers Indian MIRV it would deepen nuclear competition between the two Asian nuclear powers and reduce security for both. This calls for both countries to show constraint but it also requires the other MIRVed nuclear-armed states (Britain, France, Russia and the United States) to limit their MIRV and offensive nuclear warfighting strategies. Actually it’s rather surprising they’ve taken this long to deploy it. That China has mirved its nm shd not surprise the US.The US with its overwhelming conventional and nuclear primacy can easily pulverize China a thousand times . In fact according to the Siop,the US military are poised to deliver at least two thousand nm on China in an hour. So can you blame the PLA. If the roles were reversed,the US would do exactly like the PLA. Get real. The Chinese will make sure any war,conventional/nuclear,will be unwinnable and extract a prohibitive price tag. With the current US provocation in the SEA waters in the name of fon,the Pentagon is trying to goad China into a fight or to humiliate China. Get real .The PLA aint going to fall for the bait because they know they could be blitzed.Thats why China must continue to increase it nw to a thousand .They will make sure at least a hundred US towns/cities with over a hundred thousand people,will be razed if China is to be hit by a massive number of nm. This current fon is nothing but affront for the US to show its naval supremacy. Nothing lasts for ever in a changing world . Sooner or later,the US will run out of funds to feed the war machine.Until that days comes,China and indeed Russia must be prepared for any US unilateral strike to disarm them . The US has a golden opportunity to install the thaad system in SK after the NK missile launch. To call NK a threat to the international community is plain bs. Read the international community as SK/US/Japan and to a lesser extent the Philippines.These are all the US henchmen/women. Of course the thaad is aimed at neutralizing China’s icbm .What can NK one/two or even 5 nm do the US?It will be wiped off the world map doing so. If Park is naïve,Seoul and 50% of SK could be destroyed if the US were to raze NK. shd it try to disarm China. in t he name of democracy and fon are going to be over soon.Even amassive rearmament of conventional and nuclear forces cannot and will never make a war winnable or the US escaping catastrophic destruction.